Apple Stock: Should the Tech Giant Raise Its Dividend? Despite an aggressive share repurchase program and a meaningful dividend, Apple may still have some room to be significantly more aggressive with its payouts to shareholders. But would it be in shareholders' best interest? It's no secret that Apple (NASDAQ:AAPL) is a cash cow. But despite an aggressive share repurchase program and a meaningful dividend, the company may still have some room to be significantly more aggressive with its payouts to shareholders. But would it be in shareholders' best interest? The answer may surprise you. Given Apple's cash hoard of $164.5 billion, it may first appear to be an easy decision: Of course, Apple should pay out more cash to shareholders! But, unfortunately, there are more factors to take into consideration. Particularly, investors need to understand that only $26.8 billion of Apple's cash hoard is domestic cash. Further, to avoid taxes for repatriation, Apple must use domestic cash to pay dividends and repurchase shares. To address this issue, Apple has been borrowing money at very low interest rates. In the company's most recent quarter, for instance, Apple's domestic cash grew by $8.3 billion sequentially thanks to a debt offering that raised $12 billion in cash. Despite periodic debt offerings, however, domestic cash is going out faster than it's coming in, as the company continues to pay out billions every quarter in share repurchases and dividends. Consider, for instance, that Apple's domestic cash in the year-ago quarter was about $35 billion -- just over $8 billion higher than today's levels. And this trend doesn't look poised to reverse course. Apple boosted its capital return program for the second time in two years in April, increasing its capital return program from $100 billion to $130 billion. And though the program expires at the end of calendar 2015, Apple still has $56 billion to spend on dividends and repurchases. So, what should Apple do today? To simplify Apple's situation as much as possible, here is in imperfect but useful lens through which to view Apple's situation. In a roundabout way, Apple is set to pay nearly 100% of its current earnings ability in either dividends or repurchases in the next year and a half. How's that? Apple earned $38.5 billion in the trailing 12 months. Extrapolating out another half year, Apple is currently earning about $58 billion every year and a half. That's only $2 billion higher than the $56 billion remaining in Apple's capital return program that has one and a half years to go. Yes, Apple does have a massive cash hoard, and it would be nice to see the company make a bigger dent in it. But once you consider Apple's domestic cash problem, the tech giant's current rate of returning cash to shareholders is actually very aggressive. 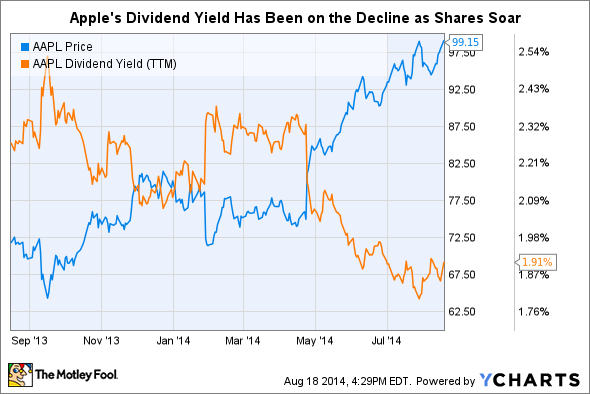 So, should Apple boost its dividend or increase its share repurchase program? Given how aggressive the overall capital return program is today, the total capital return program seems to be in shareholders' best interests. In other words, the plan already looks great and doesn't need any changes to boost shareholder value. But when the current program expires at the end of 2015, of course, Apple will need to revisit this issue. And with the stock possibly trading significantly higher by the end of the program than the bargain levels it frolicked in for much of the repurchase expenditures so far, repurchasing stock may not make as much sense going into 2016. The allocation of repurchases to dividends, therefore, may come into focus. Further, while Apple has already said that it "plans to increase its dividend on an annual basis," the decision of the extent of dividend increase and share repurchase authorization going into 2016 may end up depending on the share price at the time. iPhone 5s. The majority of Apple's cash flow comes from its growing iPhone business. In April, Apple announced a dividend increase of 8%. If the company acts in shareholders' best interests, the rate of Apple's dividend increases should grow in future years if shares become overvalued (as Apple shifts money away from repurchases toward dividends), and they should stay the same or even decline if shares appreciate slowly, stay at current levels, or fall (as Apple continues to focus on aggressive share repurchases). In other words, with the stock arguably worth around $120, Apple should keep dividend increases around the current rate of 8% while keeping share repurchases robust if shares continue to trade below or around $120. But, if shares trade meaningfully higher than $120, it may be in shareholders' best interest for Apple to scale back on repurchases and significantly boost Apple's dividend. Of course, intrinsic value can change; this is a best guess based on the information available today.